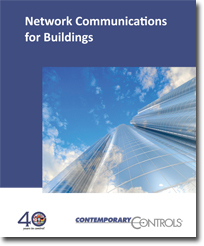 Contemporary Controls has published Network Communications for Buildings from a collection of prior articles from our Extension and Essentials that were supplements to our print newsletters beginning in 1999. All the articles have been updated to the latest practice so now the best material on network communications can be found in one concise book. The intention of Network Communications for Buildings is to present the material in a commercial-free format in keeping with the mission of the open-systems movement. Network Communications for Buildings includes coverage of the following technologies: EIA-485 Physical Layer, Shared Ethernet, Switched Ethernet, Ethernet with Fiber Optic Cabling, Power over Ethernet (PoE), Internet Protocol (IP), Transmission Control Protocol (TCP), Subnetting IP Networks, Simple Network Management Protocol (SNMP), Virtual Local Area Network (VLAN), Spanning Tree Protocol (STP), Modbus, and BACnet. It also includes applications about using Managed Switches and using IP Routers. It concludes with troubleshooting advice and a glossary of terms. To download your free copy, simply provide your name and email below and you will be given a link to the PDF.